Brush pizza dough with olive oil, garlic and a bit of salt. Evenly sprinkle with grated pecorino. 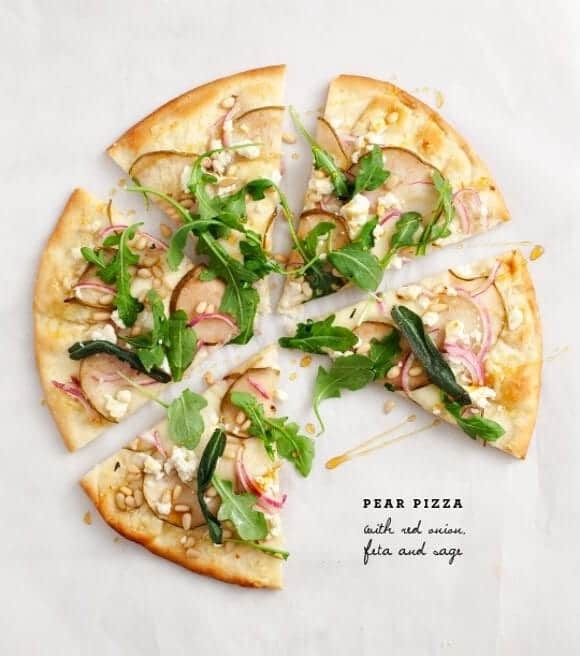 Near the edge, place a layer of pears in a circle, then slightly overlap the pear layer with a circle of sliced mozzeralla, then another circle of pears, etc. Top with red onion slices, crumbled feta and pine nuts. Drizzle with olive oil and sprinkle on a few pinches of salt. Cook until browned and bubbly (timing will depend on your dough - mine was very thin - I cooked my pizza at 450 for about 8-10 minutes. Meanwhile fry your sage. Heat a small skillet with about an inch of oil. Toss one sage leaf in to test if your oil is hot enough (if it bubbles as it hits the oil). Fry sage leaves for about 5 seconds each. Remove place on a paper towel to cool. Remove pizza from the oven and top with arugula and sage leaves. Optional - add a few pinches of red pepper flakes and a drizzle of honey.